This place is a UNESCO World Heritage Site, listed as Ajanta Caves. Deutsch: Die Ajanta-Höhlen liegen in der Nähe der Stadt Ajanta, im Nordosten des indischen Bundesstaates Maharashtra, ca. 100km nördlich der Stadt Aurangabad. 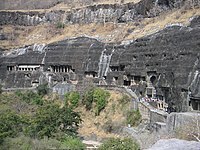 English: Ajanta (more properly Ajintha), a village in the erstwhile dominions of the Nizam of Hyderabad in India and now in Aurangabad district in the state of Maharashtra (N. lat. 20 deg. 32' by E. long. 75 deg. 48') is celebrated for its cave hermitages and halls. As of 1983, the Ajanta Caves have been an UNESCO World Heritage Site specifically nominated for the international World heritage program. Français : Ajantâ est un village de l'état indien de Maharashtra célèbre pour son groupe de 29 grottes artificielles creusées dans du basalte dur, dont trois inachevées. En 1983, le site d'Ajantâ a été classé au patrimone mondial de l'humanité de l'UNESCO. मराठी: अजिंठा लेण्या भारताच्या महाराष्ट्र राज्यातील औरंगाबाद जिल्ह्यात स्थित पाषाण तोडून बनवलेल्या लेण्या आहेत. यांना १९८३ मध्ये युनेस्को द्वारे विश्व धरोहर स्थळ म्हणून घोषित केले आहे. Nederlands: Ajanta (correcter Ajintha) is een dorp in de vroegere heerschappij van Nizam van Hyderabad in India en ligt nu in de staat Maharashtra. De plaats is beroemd vanwege zijn grothermitages en zalen. Sinds 1983 staan de Ajanta-grotten op de lijst van Werelderfgoed van de UNESCO. Pages in category "Ajanta Caves"
Media in category "Ajanta Caves"
The following 200 files are in this category, out of 482 total.